The Imperfectionists tells the stories of the employees of an English-language international newspaper based in Italy. The title really does tell you all you need to know about this novel — it’s about a group of people who are utterly imperfect. Unfortunately, many of them are not just imperfect — they are annoying. I think the only character I even remotely liked was Kathleen, and I actually felt slightly bad for her. Abby’s chapter was OK, and the twist at the end did throw me for a bit of a loop. Winston’s chapter was incredibly painful to read, although I think it was more because of the character of Snyder than Winston himself. Every time Snyder spoke, I wanted to chuck my Kindle out of the nearest window. The guy was, I believe, in his 50s, talking like a teenager. Shudder. I’m sure others probably saw this chapter as comic relief, but it was unbearable to me. Really, the only redeeming quality of this novel for me is the fact that it is about my field, and I can relate to some of the material. Specifically, I related to Herman, the paper’s corrections editor, and his disdain for errors. Other than that, I couldn’t wait for it to be over. I don’t know if this was just another case of overhype, or if it was just poorly written, but this whole novel was imperfect. This is unfortunate, because it had the potential to be a great debut, but it just fell flat on so many levels. 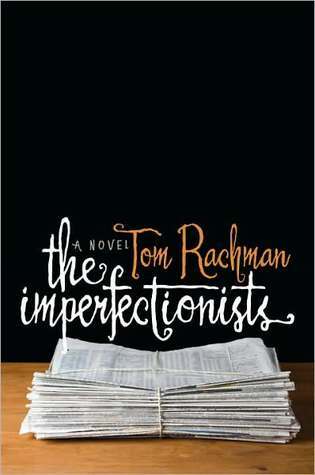 Tagged The Imperfectionists, Tom Rachman. I agree, I really like the cover. That was part of why I wanted to read it! But I just wasn’t very impressed, which was unfortunate.